Bandai Namco’s My Tamagotchi Forever is a virtual pet game that transports you to a bright colorful world full of adorable alien life forms. Don’t worry, they are not harmful. In fact they can be as playful and adorable as your pet kitty and are hungry for food, games and tickles. You will have to look after your pet make sure to take them to the loo on time; else he won’t eat or sleep. Finally, you can put him to sleep after completing all tasks. The sole purpose of your virtual life is to keep your pet happy and there are various ways to do so. You can pet him, feed him his favorite food, give him bath or take him to the loo. And if you are bored, you can just play some mini-games to earn coins. 1. The fun begins in your living room. You will see 4 action buttons on the bottom of the screen. Each action button has an icon: A happy face, cutlery, toilet and crescent moon/star. When a button’s background color is red, it’s empty and your pet needs you to do a particular task to fill it up and turn green. You will have to tap that button to move your pet to a new room and then complete a task to make the background color turn green. For example, if the cutlery button has a red background color, just tap the button to take your pet to the dining room. You will then have to feed your pet until the background color changes to green. If the happy face icon’s background color is red, then you will have to tap him until it slowly fills up and turns green. 2. When an action button’s background color turns green, it not only suggests that your pet is happy, but also earns you XP and coins. The number on the upper left corner of the screen shows your current level. When you earn XP, the circle around it fills ups slowly. When it fills up completely, you level up and unlock playground equipment, decorations and new food items. You can place them outside your house. 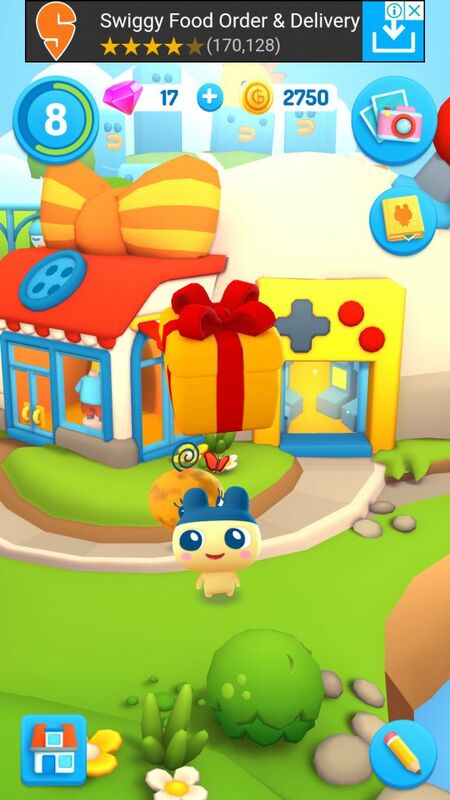 Once you unlock a toy or decoration, you can use coins to purchase it so that you can permanently place it in Tamatown. 3. Each pet has his/her favorite playground equipment, decoration or toy. When you buy one, your pet will happily play with it. While he is playing, quickly take a pic to earn some coins. When you take a pic, it will be stored in your album. You can take another picture of the same equipment – just tap it and your pet hops into it. Now tap the camera icon and take a picture. You will replace this new pic with the old pic, but you won’t earn any coins. It’s your pet, but you can’t just have it your own way. Simply speaking, you just can’t pet him when he wants to go to the loo or feed him when he is feeling sleepy. When most of the action buttons are empty, just tap your pet once and an action button will wobble. You will have to tap that button and complete a task until it fills up completely. If you do some other task, your pet won’t listen – he will just nod his head and close his eyes displaying his displeasure at your move. Also, when a task button fills up completely, it’s futile to keep doing the same task over and over again. You can do some other task or play mini-games when all buttons are full. When feeding your pet, pay attention to the speech bubble appearing above him. It will show his favorite food. Quickly tap the plus icon on a plate and fill it with his fave food item. This way you can fill the cutlery button faster. Normally when an action button is green, doing the same action won’t increase your XP or give extra coins. But you will surely get extra XP and coins every time you take your pet to the bathtub, put soap on him and turn on the shower. You may have noticed that there’s no shower icon. This is probably because you can give him a shower any time and may even get some XP and coins while doing so. Unlike other actions, bathing your pet gives you an XP boost occasionally, even when all action buttons are full. My Tamagotchi Forever’s cool mini-games are perfect time-wasters, but did you know that playing them will earn you coins? You must accumulate enough coins to purchase playground equipment and decorations, so that you can see your pet playing with it and even take a cool picture. Completing simple tasks will let you earn limited number of coins. Playing simple mini-games is a sure-shot way to earn lots and lots of in-game currency. When your pet is happy and cheerful and you have completed all tasks, it’s time to play some games. You will see a thought bubble with a joystick above your pet. The same icon will appear just above the happy face button. Tap it and you will be taken to the “Arcade” page where you can see a list of mini games which you can play anytime. There are a total of six games, of which the first three can be played instantly. To play the fourth game, your device must support augmented reality. You will have to install the fifth and the sixth game from the play store first if you want to start playing from the Tamagotchi app itself. Out of the first three games, “Match 3” and “Band Practice” are very easy to play and earn you more coins than other games. You might be pretty familiar with the mechanics of the first game. You will have to match 3 or more objects to score points and earn coins. You will also have to reach score targets to play a new level. In the second game, you will have to tap scrolling musical notes before they disappear. You will receive one coin for every 5 notes that you tap. This is probably the easiest game and you can earn plenty of coins. When a game ends, don’t forget to double coins by watching a short video. Also, complete daily challenges that are displayed on the bottom of the Arcade screen to earn bonus coins. 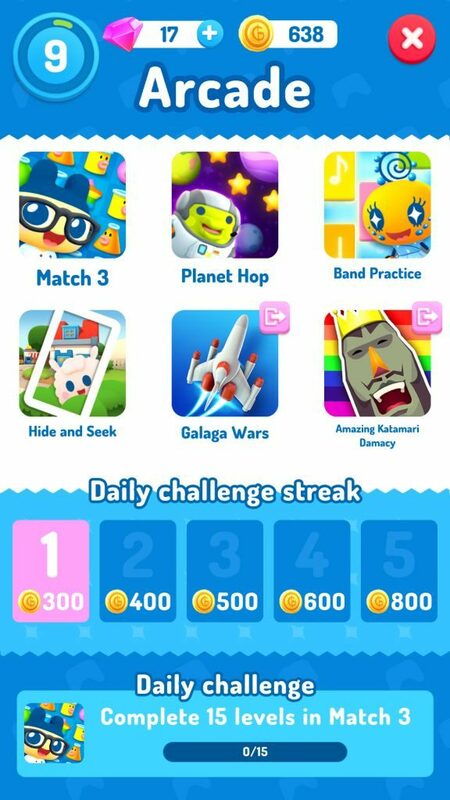 These challenges are game-related, such as collecting an X number of stars in planet hop, matching an X number of objects in Match 3 etc. When you place new playground equipment/decoration in Tamatown, your pet will love to play with it. Just tap the camera icon above a newly placed decoration and then tap the icon below the viewfinder to take a pic. It will be kept on your photo album as a “memorable moment”. You will get coins whenever a new pic is added to an album’s page. To unlock new outfits, you must complete pages in an album. Each page belongs to a particular pet. When you are in the living room, just tap the album icon on the upper right corner of the screen to check which pics are missing from a page. You can switch to a new unlocked character by tapping the profile pic on the upper right corner of the screen of your album page. You will be taken to a list of characters, just tap a character’s profile pic to see what decorations you need to place in order to unlock something new. Your pet’s page is completed when you place all toys and take pictures of them. Placeholder pics in that page will display pictures of required toys. You will have to purchase toys/decorations, place them in one or more areas outside your pet’s house and then take pics of your pet playing with them to complete a picture page. 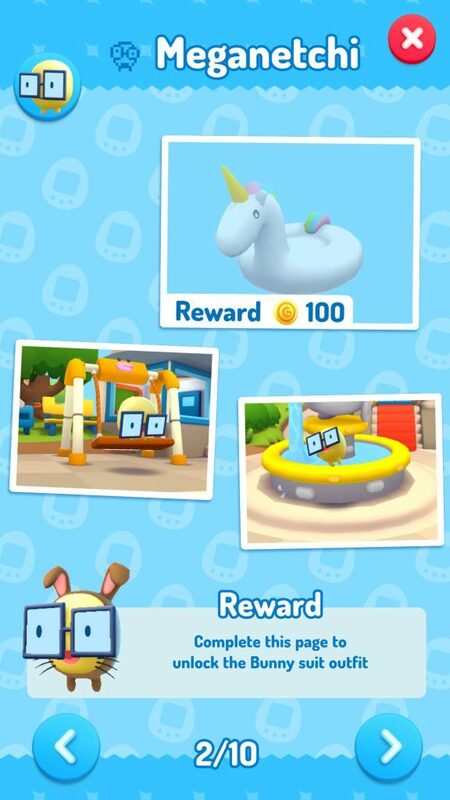 For example: To unlock a new “Bunny” outfit for your pet Meganetchi, you will have to unlock and place three decorations/toys – fountain, playground (swing) and an inflatable rubber unicorn. Once done, you must take pics of your pet playing with them. When you evolve a Tamagotchi character to an adult, you can let them choose his/her career. You will, however, have to finish certain objectives to complete their career. 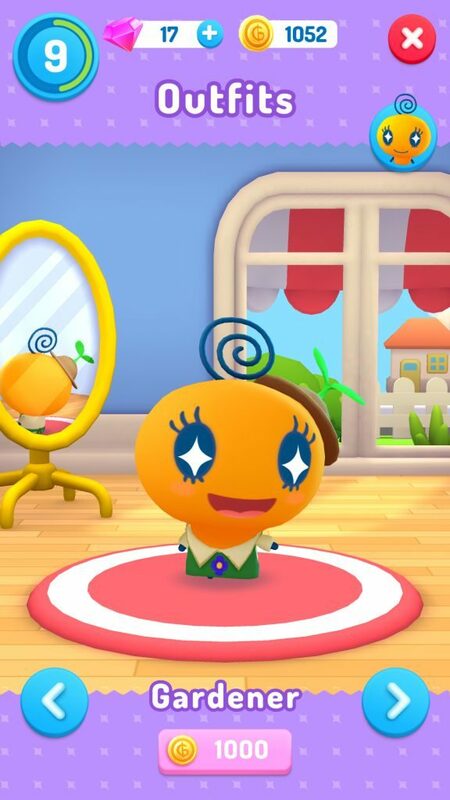 For example, when you evolve Meganetchi into an adult, you get a new character called Memetchi. To evolve a character, you will need to experiment feeding different types of food items to your pet. Make sure you select various new delicacies, including those that are unlocked when you reach a new level and place them on your pet’s plates to see if he/she likes it or not. Sometimes, your pet won’t like a new food and would just close his eyes and nod his head. You will have to feed his favorite food first and then try to feed him another food type. Once evolved, your pet is ready to choose his career. To unlock it, you must complete a few objectives first. 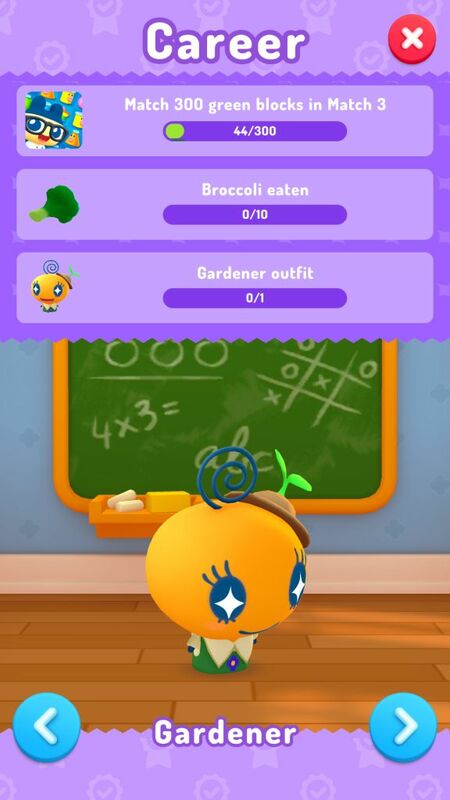 In Memetchi’s case, you will have to finish these objectives: Match 300 green blocks in Match 3 mini game, feed 10 broccolis and find a costume. You can unlock a new career, such as a pop star, but to do that you will have to unlock all photos in page 2 (which is page 9 of the full album) of her photo album. You may have noticed that some pages can’t be completed until you complete a particular Tamagotchi character’s career. Such careers involve completing a few simple objectives including getting a new costume. 1. 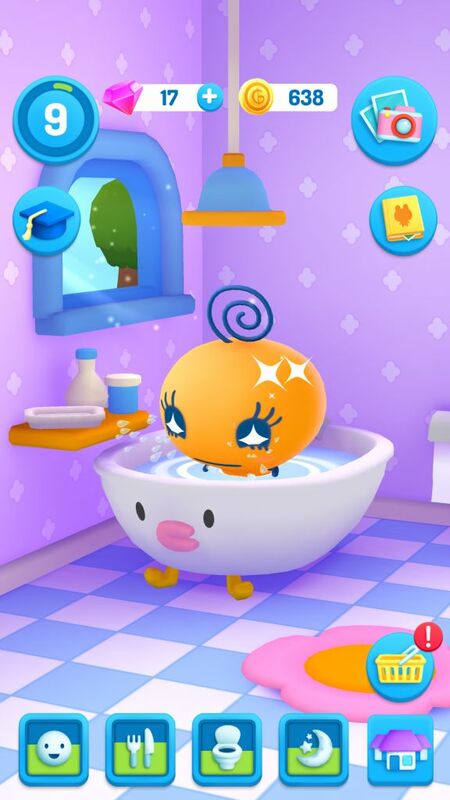 When you are in your virtual pet’s home, just tap the house button on the lower-right corner of the screen to move out of your house. 2. Now you are in Tamatown. Just tap the second house – the one with a big bow above it. This is where you will buy and change outfits. 3. Tap the right arrow button to change Memetchi’s costume. The first outfit will be the gardener’s outfit. Tap the price button on the bottom to buy it. 4. 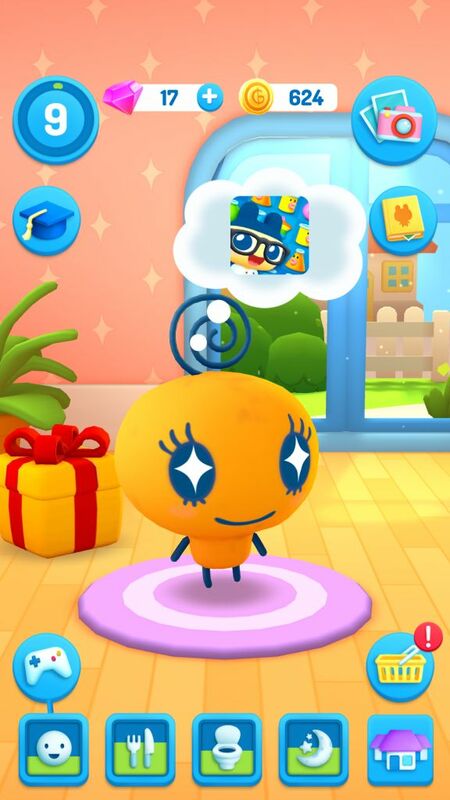 To change a character, just tap Memetchi’s tiny profile pic, which can be found on the upper-right side of the screen and then choose another character. 1. When an action button turns red, complete that action to get coins. 2. You can also earn them when you give a bath to your pet. You just need to scrub him clean to get 20 extra coins. Do this when your pet is dirty to get coins. 3. When you are in your living room, keep an eye on the Tamatown button on the lower-right corner of the screen. When you notice an exclamation mark above it, quickly tap the button and swipe the screen to explore your surroundings. You might stumble upon a joyful pet with a gift box above him. Just tap the box to get bonus coins. You can also double coins by watching a short video. 4. As explained earlier, playing mini-games is one sure-shot way to earn lots of coins and the best part of this is that you can play them any time. Don’t forget to complete daily game objectives to get extra coins. While there’s no way to change pets, you can surely bring back Mametchi by evolving a baby pet. If you have any other ideas, post them in the comment section. Unfortunately, there is no way to change your character. You can change its career by switching it with the arrows and selecting study. How am I supposed to evolve individual characters if I can’t switch active players/characters? There is no way to switch between characters. You will have to continue with the current character until he/she evolves and you complete their goals. I had to complete all 3 goals of adult Mametchi and then I got a new egg. I tapped it to get a baby Mimifuwatchi. How long does it take for your pet to recharge while sleeping? If I have many characters is it possible to change back? As of writing, there is no way you can switch from one character to another Tamagotchi character directly. However, we are trying to find out a way to do that. Check the last section (point no. 8), it shows a way to switch to an adult Tamagotchi character called “Mametchi”. This possibly is one way to change a character. All goals are completed but the bunny does not have a proven on it why can’t I buy it?